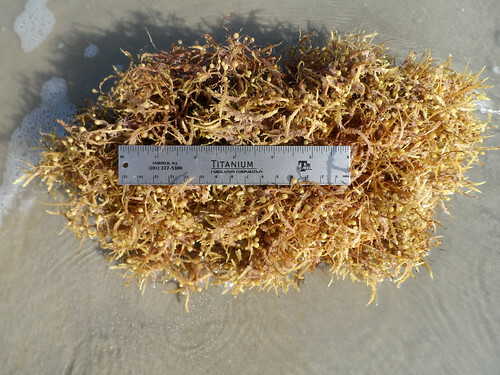 Coating the Gulf Coast shores and floating in the Gulf waters, sargassum seaweed is generally considered to be a nuisance by beach-goers and city officials, but it plays a critical role in stabilizing beach sand when washed ashore. The seaweeds drifts in all year round but is heaviest during the summer. 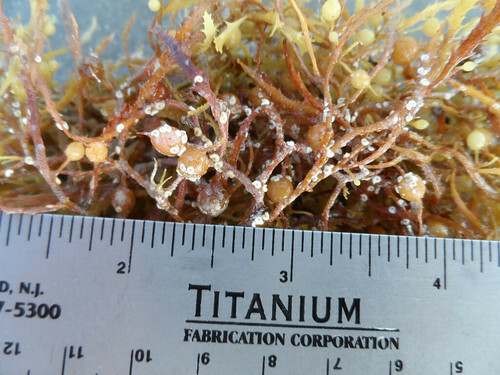 The floating clusters of sargassum are home to many creatures including tiny crabs, shrimp and other crustaceans. 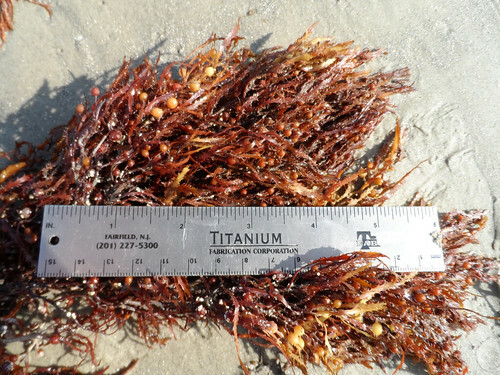 Two forms of sargassum wash up on shores from Florida to Texas. To the untrained eye they look almost identical and since they are both edible, one doesn't have to be precise in their identification...though you should be. Sargassum fluitans generally has wide, short-stalked "leaves" and its pods usually are not tipped with small spikes. 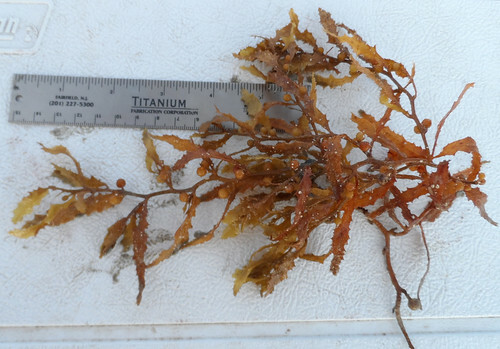 Sargassum natans has long, narrow "leaves" and its pods generally do have a single, tiny spike at the end opposite that attached to the main body. 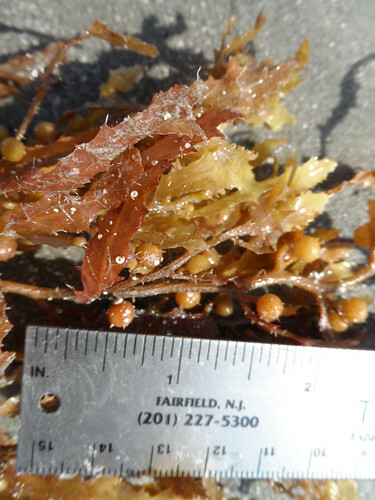 All parts of sargassums are edible, including the numerous crustaceans that make this seaweed their home. It has a somewhat bitter flavor and is not considered to be as desirable as many of the more northern Pacific and Atlantic seaweeds. However, it is quite plentiful and a decent source of calories. Traditionally it is chopped up and cooked in many ways including boiled, steaming, and sauteeing in hot oil. Experiment until you find a method and flavor you like. The sargassum seaweed will be at its most fresh when plucked from the water rather than collected from shore but watch out for sharks in the water. Perhaps more of a threat is the possibility of contamination with toxic blue-green algae so if the sargassum isn't brown to reddish in color avoid it. 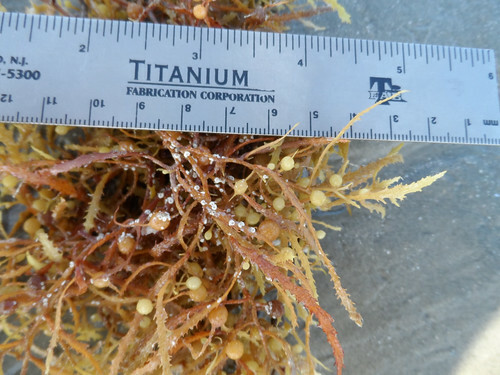 Please remember that sargassum is a vital part of a healthy, biologically diverse shoreline and on Galveston Island a permit is required to harvest any.